What voltage to apply to a 1.2V rechargeable battery? Hi there, I am just experimenting with a simple circuit that recharges 1.2V 3000mAh AA battery. But I have not idea what is the correct voltage to apply to the battery to recharge it. Do I need to apply 1.2 Volts? Maybe a little bit more? This circuit recharges the battery using induction, so depending the distance the circuit receives more or less voltage. Do I need to apply 1.2 Volts? Maybe a little bit more? It depends on the battery chemistry. For a NiCd or NiMH cell you should be applying a constant current. For a 3000mAh cell, 300mA would be appropriate. The voltage will be whatever is required to provide 300mA.
? Care to explain how ? "The voltage will be whatever is required to provide 300mA." Do you mean that can I apply any voltage as long as the current is 300mA.? Ok, I am going to explain. I am using a small Tesla coil I bought on eBay a few weeks ago. The secondary of the Tesla coil produces high voltage and high frequency energy. I use that HV-HF to feed a circuit that is basically composed of a few capacitors and diodes. This "rectifier" uses a single wire as an antenna to absorb the oscillations that are coming from the Tesla coil. Re. charging a cell, if the current is limited the voltage at the cell is likewise limited. The hard part is deciding exactly when it is fully charged; you should use a voltage monitor circuit that senses when the voltage stops rising - or purpose-made charge controller. Once it has reached full charge, if the current is less than 1/10th the capacity rating of the cell, a moderate excess time will not do any great harm, but higher than that will rapidly degrade the cell. Once iot has reached full charge, if the current is less than 1/10th the capacity rating of the cell, a moderate excess time will not do any great harm, but higher than that will rapidly degrade the cell. It's just a very small Tesla Coil. But thanks to give that advice about the radio regulator. So you suggest to start charging it at 1.2V and increase over time near 1.5V, right? About to know when it's fully charged I have purchased a battery meter. At the moment I have to disconnect the battery and check the charge manually. I haven't measured how much current is flowing in the circuit, but I think it's less than 1/10th of the capacity of the cell. You must limit the current into a battery. You don't set the voltage you set the current. Here is a picture of a typical bench power supply. Depending on what type of battery the voltage should never be above 1.5V so set the voltage know for 1.5V with no battery. Then short out the supply and set the current for 300mA. Now the supply will supply 300mA or less and 1.5V or less. If you connect a discharged battery it will start out at 1.2V and the supply will limit the current to 300mA. The voltage will slowly work its way up to 1.5V. At that time the current will head down. 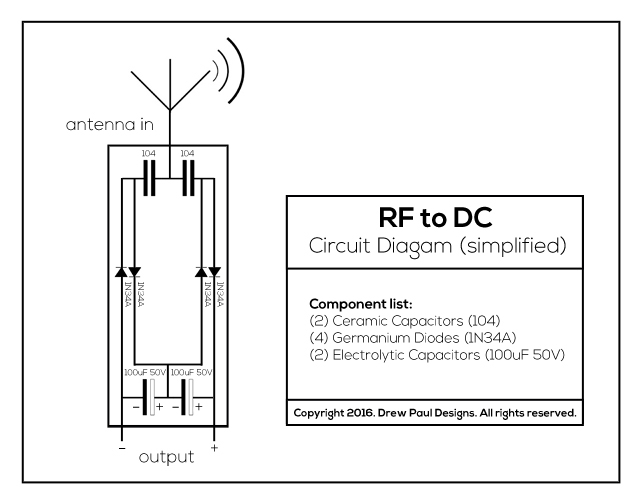 With your antenna it is likely you can't make 300mA so you don't have to limit the current from the antenna. As your diodes are only rated at 50mA (so a bridge gives 100mA maximum) I hope you're not getting 300mA? - or your diodes won't last very long. Always nice to see 60+ year-old germanium diode technology solve a problem. Not that modern solutions don't exist but, hey, why not pick an old, leaky, low-current, expensive diode technology to make your project unique. What that means is, that if you limit the current, the battery voltage will be whatever it takes to charge at that current. It shows a NiMH battery being charged by a constant current, from a constant current charger circuit. You will see that the voltage varies through the charging cycle. At the end of the charging cycle, when the battery if "full" the voltage actually decreases. (The downside of the "hump" before the charger is turned off). A generator of wideband RF (radio) interference which will make you most unpopular with your radio neighbours. All in all a seriously bad idea. You may find Battery University interesting as they cover charging of all sorts of battery chemistry. Here is more info on charging your NiMh batteries. What is th exact point in the schematic where I should measure mA to know if the diodes are receiving too much current? From the output to the battery. J Nichols, did you notice that the radio receiver circuit has no coil to pickup the induction from the fairly low frequency tesla coil? The tesla coil and the receiving coil must be VERY close together. Did you notice that a battery is charged with current, not voltage since it limits its own voltage. Go to www.batteryuniversity.com to learn about the details of charging a Ni-MH battery. Usually a battery charger IC is used to do it properly. Thanks, in some days I will perform the test. Thank you very much, those links seem to be very helpful.